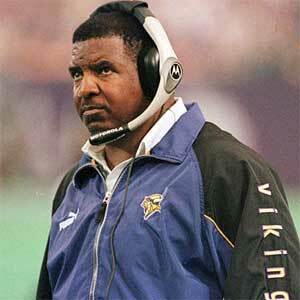 EDEN PRAIRIE, Minn. — Dennis Green was forced out Friday as coach of the Minnesota Vikings with one game left in a dismal season that has the team out of the playoffs for the first time since 1995. Green, whose 10-year tenure ties him with Pittsburgh's Bill Cowher for longest in the league, accepted a buyout of the last two years of his contract. Offensive line coach Mike Tice will coach the team for Monday night's finale at Baltimore. Owner Red McCombs said the team's 5-10 record wasn't a factor. He said he "couldn't find a way for leadership with Dennis that worked." "I admire Dennis a lot and appreciate what he's done," McCombs said. "But I also know that we live by the fact there ain't never a horse that can't be rode and there's never a cowboy that can't be throwed." Green had been scheduled to receive about $5 million over the remainder of his contract. When Green was hired 10 years ago, he was only the second black coach of NFL's modern era. Art Shell, hired by the Raiders in 1988, was the first. "I've been very blessed and very fortunate," Green said. "The players have been absolutely fantastic." Green ran a morning practice as if it were routine, and several players were surprised to learn he was leaving. Some were teary. One player, Travis Prentice, angrily threw his jersey into his locker. "I don't know what to say, I'm as shocked as all of us," linebacker Jim Nelson said. "We have one game left, and this will be a distraction a little bit, but we still have to play." The usually quotable Matt Birk, the team's only Pro Bowl selection, said he didn't want to comment. Michael Bennett, the rookie running back Green took with his top pick last year, sat alone at his locker with a towel draped over his head. Defensive back Orlando Thomas was benched for several games by Green this season, but said he wouldn't be in the league without Green's help. "This is the guy that brought me into this organization and the NFL with all the things I've had to deal with as an athlete and as a man," Thomas said. "It's just tough." Randy Moss' agent said the wide receiver did not want to see Green leave. "I could just tell you that if coach Green is gone, I'd say that Randy is disappointed," agent Dante DiTrapano said. "He's extremely loyal to coach Green. … Coach Green is the one he wants to play for." The Vikings have been struggling through a 5-10 season that began with the death of offensive tackle Korey Stringer. In recent weeks, Moss has been inconsistent and acknowledged, "I play when I feel like it." And Green's relationship with receiver Cris Carter, a longtime leader on the team, had reportedly cooled. On Dec. 11, McCombs gave Green a vote of confidence. Asked then if he could say Green will be the Vikings' coach next season, McCombs replied: "Yeah. Absolutely." ESPN, which first reported on Thursday that Green appeared to be on the way out, said Tampa Bay coach Tony Dungy would be a leading candidate to take over the Vikings. A source close to Dungy, speaking on condition of anonymity, told The Associated Press that it is unlikely the Tampa Bay coach would want the job. University of Texas coach Mack Brown and Tice also have been mentioned as possible replacements. This will be the first losing season in Green's 10-year tenure. Since 1995, the Vikings are 97-62 under Green and have reached two NFC championship games. Last year, however, they lost 41-0 to the New York Giants, and Green was roundly blamed for the defeat. Nevertheless, McCombs signed Green to a two-year contract extension, with an option for a third season that guarantees him about $5 million for the 2002 and 2003 seasons. Green has been under pressure before. In 1996, after the Vikings sustained their fourth straight first-round playoff loss under Green, many fans wanted him replaced. The following year, the Vikings rallied in the second half to upset the Giants in a first-round playoff game and had made it past the first round each year since.